This has been a long and crazy day of high-class poker in Saalbach-Hinterglemm, and Allan Bække has thoroughly earned his first place money and his two trophies. The day started at high speed with four players busting in around two hours. But with the excellent structure and a lot of chips in play, Bække would have to endure a three-hour-long three-way and a two-hour heads up match before he could claim the title. The 27-year-old Danish pro, who plays online as "Sifosis", took a massive chip lead way back on Day 3 when he found aces on the last hand of the night to beat Paul Valkenburg's pocket kings. He never looked back. Bække remained chip leader coming into the final table, and although he lost it a few times - the final four spent several hours swapping the chip lead between them - Bække never lost focus and fought his way back to the top. At one point in the heads up match Bække had a 7:1 chip lead over Russell Carson and had him all in and dominated. Carson got lucky that time to stay in the game, and then doubled up again not long after to bring the stacks back to even. 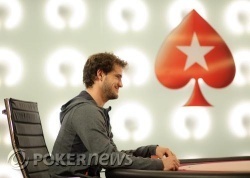 But Bække, the online heads-up specialist, remained calm and got it all back in the end. Bække has every reason to be over the moon with his first big live win, but to be honest there are few people in the Alpine Palace right now who will be overly disappointed with their week here in the Austrian Alps. Poker aside, the good folks at PokerStars and the Alpine Palace have treated everyone to a frankly astoundingly luxurious week full of great skiing, amazing food, glorious scenery and the last word in hospitality. It is with the utmost reluctance that everyone will be trudging home in the morning, but we know that we'll be back here next year. PokerNews.com will be back on the EPT trail in San Remo in just about two weeks, but until then, from all of us here in Saalbach-Hinterglemm, it's over and out. First hand back, Russell Carson opened on the button and it looked like Bække reraised, only for Carson to shove; the cards were on their backs almost immediately. Carson was drawing dead on the flop, and the plucky Canadian could not manage another double up. Another break down, another level up. We've come to the end of another level, and it's time for one of those pesky 10-minute breaks. Just enough time to grab an espresso. Bække raised to 260,000 and Carson called; a flop ensued. Carson check-called a 300,000 bet from Bække and they proceeded. Both players checked, and everyone got to see a river too. Carson now bet out 350,00 - and after just a moment, Bække gave it up. Allan Bække raised to 260,000 on the button and Russell Carson made it 720,000 to play from the big blind. Bække called and the flop came and Carson bet 800,000. Bække gave it up and Carson took it down. Russell Carson made it a standard 260,000 from the button and Bække called. Bække bet out an amount we sadly couldn't quite make, but the raise from Carson was to 1.1 million. Call. Suddenly the hand got interesting. Disappointingly, though, they checked down the turn and river, and Carson flipped for a straight draw that hadn't come in. 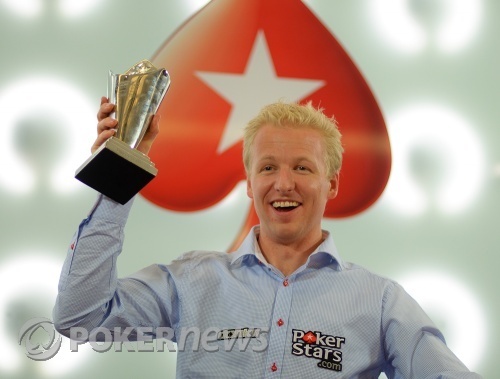 Bække's for two pair was good, and he picked up the healthy 2.7 million pot. Allan Bække raised to 260,000 on the button and Russell Carson called from the big blind. The flop came down and Carson check-called 275,000. The turn card and river card were checked. Carson showed and he won the pot.